Basic driving habits practiced by motorists when sharing the road with trucks could save many lives. 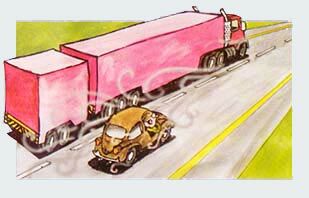 There are four blind spots around tractor –trailer combinations where cars disappear from a truck driver’s view. 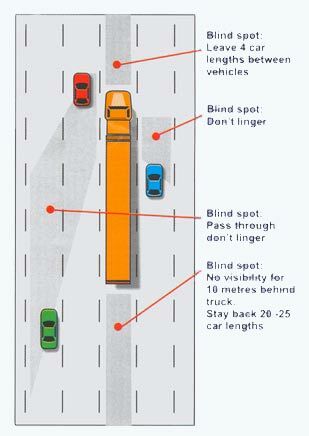 Trucks have deep blind spots directly behind them and on each side. If you tailgate the truck driver can’t see you and your own view of the truck is obstructed. The longer the truck, the more distance you will need to pass it. Don’t pass unless you are absolutely sure there is enough room. Pass from where the driver can see you – not from directly behind the truck. When passing –stay as far to the right as is deemed safe. This reduces the effect of air turbulence on your vehicle and gives you a margin of safety if the truck moves outside of its lane. Don’t linger in the passing. It is possible to get rear-ended by a truck or bus if you cut in front too soon after passing. A truck can’t stop quickly! Large trucks create a lot of air turbulence around them. Motorists should be prepared for a bit of “rock-and-roll” from air turbulence when passing a truck – Keep a firm grip on the steering wheel. Bad weather is a poor time to pass a large truck. The combination of splash and spray, air turbulence, poor control of both vehicles on slick services and diminished visibility increases the chance of a collision. Light vehicle drivers should turn their windshield wipers on before overtaking and passing a truck in wet weather. You need to see clearly at all times. If the spray seems more than your wipers can handle, don’t pass. 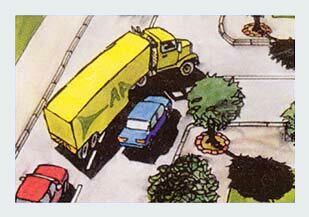 Truck drivers sometimes need to swing wide either to the left or right to safely make a turn at intersections. When a truck passes you, stay left and slow down to allow him to pass. When stopping behind a rig, remember that it might need space to roll back when it starts up again, especially on a hill. If you position your vehicle slightly to the right of the lane the driver will know you are behind and can take precautions. Unlike cars, trucks have a huge danger zone directly behind them. If you are tailgating a truck, the driver can’t see your car and you can’t see what is going on ahead of you. Stay well behind any big truck to avoid a rear-end collision. Truck wheels may throw up rocks – and certainly do throw up water when it’s raining. When driving or walking, never cross behind a truck that is reversing. Truck drivers have no rear view mirror and may not see you behind them. Darkness masks many trucks. If you see a truck at night that looks like it’s parked at the side of the road, make sure you can see the entire truck body. Slow down and prepare to stop if necessary. Many trucks are still without obligatory reflectors and reflective markings. The body of the truck could be in your path. In dim lighting, it may not be visible until it’s too late to stop.